Mumbai: Jet Airways and Bangkok Airways announced the expansion of their existing codeshare agreement to provide more choice and convenient travel options. Guests travelling between key destinations across Thailand, Vietnam, and India, will benefit from this alignment between the two airlines. Moreover, this expanded partnership will offer guests enhanced connectivity and seamless access when travelling throughout the combined networks of both the airlines. Under the expanded codeshare agreement, Jet Airways will place its marketing code on Bangkok Airways’ flights beyond Bangkok to Chiang Mai, Chiang Rai, Koh Samui, Krabi, Phuket, Sukhothai and Trat in Thailand and Da Nang, Phu Quoc in Vietnam. The codeshare flights have been opened for sale for travel starting from August 23, 2018. Subsequently, Bangkok Airways will place its marketing code on Jet Airways’ flights beyond Mumbai to key destinations like Ahmedabad, Bengaluru, Kolkata, Delhi, Goa and Chennai; as well as beyond Delhi to Ahmedabad, Bengaluru, Mumbai and Chennai. 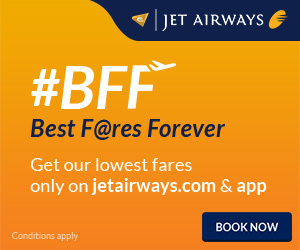 Currently, Jet Airways places its code on Bangkok Airways’ flights between Mumbai and Bangkok while Bangkok Airways places its codes on Jet Airways’ flights between Bangkok-Mumbai and Bangkok-Delhi.